Hitachi has a global parts distribution network that makes sure you get what you need as quickly as possible. We have more than 150 dealers worldwide who provide the closest support for your needs. In most cases, your dealer will have the replacement part that you require. 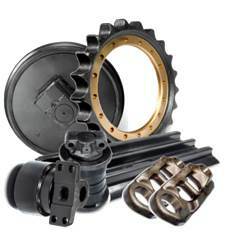 If a dealer does not have a certain part, he can order it from 4 fully-stocked regional parts depots located across the world. These distribution centres are all connected by on-line system that gives them access to share stock information such as the quantity & type of parts available. The regional depots are in turn backup by the Central Parts Depot located in Japan, minimizing delivery time and enable you to get your parts as efficient and quick as possible. Hitachi lubricants are designed to protect parts and components that are exposed to extreme environments and operating conditions. 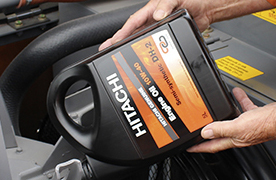 Hitachi provides a range of quality engine, hydraulic oils and greases for your machines. Our range of genuine Hitachi filtration perfectly complements the high quality of the machines. Modern engines, hydraulics and fuel systems require maximum protection for high performance and extended component life. 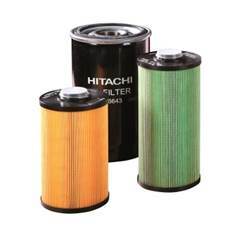 Hitachi offers a full range of engine, fuel, hydraulic & air filtration. The correct maintenance and upkeep of your undercarriage is vital to the performance of your machine. 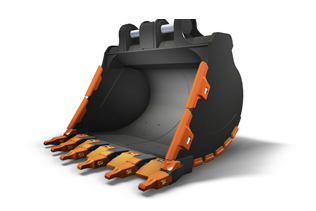 Hitachi offers undercarriage to meet the rigorous demands placed on our products. The control valve is one of the important parts that regulates oil flow and controls hydraulic device. O-rings seal the inside of the control valves. 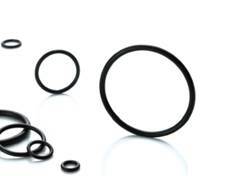 Hitachi Select Parts O-ring Kit is a package of the uniquely-developed O-rings which are replaced during overhauling control valves. Hitachi Ground Engaging Tools (GET) is designed to complement the performance and productivity of the machine. 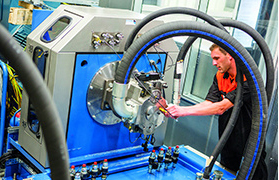 Hitachi provides quality GET solutions for the range of Hitachi machines. High performance is demanded for hydraulic cylinders that are directly coupled to the digging force of a machine. 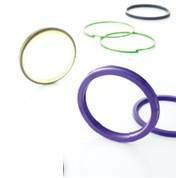 Hitachi Seal are specially developed for use in Hitachi machines to achieve longer lifespan in severe environment. There are 4 authorized facilities around the world that remanufacture Hitachi components. Each component is rebuilt and tested to meet strict Hitachi guidelines. Note: Some dealers do not handle Hitachi remanufacturing components.